Real vegetarian food in Bangkok can be hard to find. Lurking behind every plate of Chinese kale or mound of vegetable fried rice are vegetarian-eating’s ninja assassins: fish sauce and oyster sauce (and sometimes, inexplicably in a “vegetarian” dish, fried slices of pork belly), which makes the food at Baan Bai Plu Vegetarian (or "BP" for short) all the more of a treat. BP serves ahaan jay, or food that follows Chinese Buddhist vegetarian guidelines. Cooking strictly by the Buddha’s rules eliminates both garlic and onions from food. It’s an interesting comparison to South Indian vegetarian food’s focus on coconut milk and curry spices; ahaan jay uses lots of tofu and seitan (a fermented preparation of wheat gluten) to satisfy the eater. Miraculously, the flavours are phenomenal too. Many dishes will be similar to Thai-Chinese preparations already familiar to meat eaters, like a dry red curry similar to panang but with firm, fried tofu chunks in place of chicken or beef. Many of the curries are on display, making ordering easy. A vegetarian version of pad see ew is amazing — the rice noodles just tender, chunks of tempeh are marinated and then crisped in the wok, and the kale cooked to perfection with the unexpected addition of toasted black and white sesame seeds. BP Vegetarian also features sala bao, which are wrapped, steamed Chinese rice-flour buns filled with both sweet and savoury fillings. Wash your meal down with a variety of teas or infusions — the butterfly pea juice, while having a laughable name, is a delicious and refreshing brilliant blue infusion with a nice balance of sweet and sour. 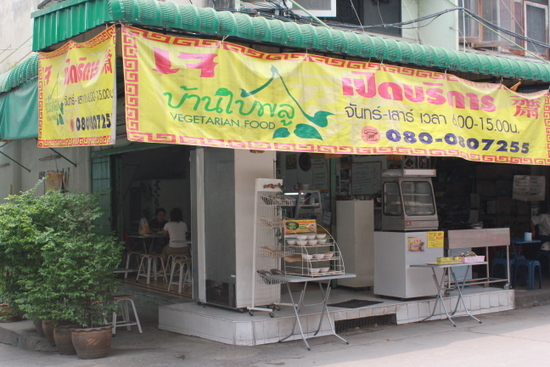 BP Vegetarian is located at Suan Pluu 8 on the south side of Sathorn Road. Walk down Suan Pluu from Sathorn and turn left onto Suan Pluu Soi 8. BP Restaurant will be on the right-hand side before the first small alley. Mains from 60 baht. Limited English, enthusiastically spoken.